Known for the thirty lakes that lie in and around the city, Thane boasts historic temples and buildings, as well as picturesque natural surroundings popular with tourists who want to escape the city hubbub. Start off your visit on the 20th (Thu): contemplate the long history of Bassein Fort, take in the spiritual surroundings of Sanghamitra Kali Bari, then take in the spiritual surroundings of Kali Bari Thane, then contemplate the waterfront views at Upvan Lake, and finally buy something for everyone on your list at Korum Mall. On the 21st (Fri), you'll have a packed day of sightseeing: take in the spiritual surroundings of St.John the Baptist Church, contemplate in the serene atmosphere at Shree Ganesh Temple, then take in the spiritual surroundings of Titwala Ganesh Mandir, and finally take in the spiritual surroundings of Manas Mandir. To find other places to visit, photos, more things to do, and tourist information, read Thane online trip itinerary builder . Mumbai to Thane is an approximately 1-hour car ride. In June, daytime highs in Thane are 38°C, while nighttime lows are 30°C. Wrap up your sightseeing on the 21st (Fri) to allow time to travel to Male. Visit Hulhumale Beach and Artificial Beach for some beach relaxation. Do some cultural sightseeing at National Museum and Hukuru Miskiiy (Old Friday Mosque). There's much more to do: hunt for treasures at Male Fish Market, relax and rejuvenate at some of the best spas, steep yourself in history at Mulee Aage, and take in the spiritual surroundings of Grand Friday Mosque. To find where to stay, photos, traveler tips, and other tourist information, you can read our Male journey app . Explore your travel options from Thane to Male with the Route module. June in Male sees daily highs of 36°C and lows of 31°C at night. Finish your sightseeing early on the 24th (Mon) so you can ride a ferry to Rasdhoo. Start off your visit on the 25th (Tue): meet some fierce fish with a shark diving experience and then kick back and relax at Veligandu Island Beach. Get ready for a full day of sightseeing on the next day: stroll through Bikini Beach. To see where to stay, reviews, and more tourist information, refer to the Rasdhoo trip itinerary builder tool . You can ride a ferry from Male to Rasdhoo in 2 hours. In June, plan for daily highs up to 36°C, and evening lows to 31°C. Wrap up your sightseeing by early afternoon on the 26th (Wed) to allow time for travel to Maafushi Island. Kick off your visit on the 27th (Thu): look for gifts at Angolo Souvenir shop, then kick back and relax at Bikini Beach, and then tour the pleasant surroundings at Bikini Beach. Here are some ideas for day two: see some colorful creatures with a scuba or snorkeling tour. For traveler tips, more things to do, and tourist information, go to the Maafushi Island trip itinerary maker site . Explore your travel options from Rasdhoo to Maafushi Island with the Route module. 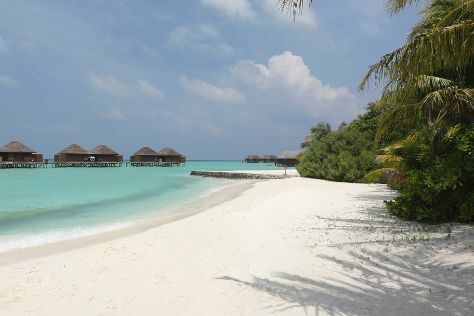 In June in Maafushi Island, expect temperatures between 36°C during the day and 31°C at night. On the 28th (Fri), wrap the sightseeing up by early afternoon so you can travel back home.